Take it up a notch with these buttermilk waffles topped with fiery fried chicken and sticky, sweet syrup. In a large bowl, mix together 1 tablespoon ground chipotle pepper, 1 ½ teaspoons of Colman’s Dry Mustard Powder, buttermilk, 1 teaspoon of salt and 1 teaspoon of pepper until combined. Place chicken lollipops in a large container and pour the buttermilk mixture over the chicken; cover and refrigerate overnight. In a large bowl, mix together the flour, 4 teaspoons of ground chipotle pepper, 2 teaspoons of Colman’s Dry Mustard Powder, and the remainder of the salt and pepper until combined. Remove the chicken from the buttermilk marinade and coat each piece in the flour mixture. Transfer coated chicken to a tray and set aside. In a large, heavy skillet heat 2 inches of oil until it registers 390 degrees F on an instant read thermometer. Fry the coated chicken, turning often until browned; approximately 10 minutes. Drain and transfer to a sheet pan set with a silicon sheet. Finish in the oven until done; approximately 30 minutes or until it reaches 180 degrees F internal temperature. While the chicken is cooking, in a small sauce pan, combine the maple syrup, salted caramel, Colman’s Prepared mustard and 1 ½ teaspoons of ground chipotle pepper. Heat over medium-low heat, stirring to combine and just warmed. Stir in the pecans and keep warm until ready to use. In a large bowl, mix together the waffle mix, cold water, eggs and oil until combined. Using a Belgium Waffle maker, make 12 small waffles. 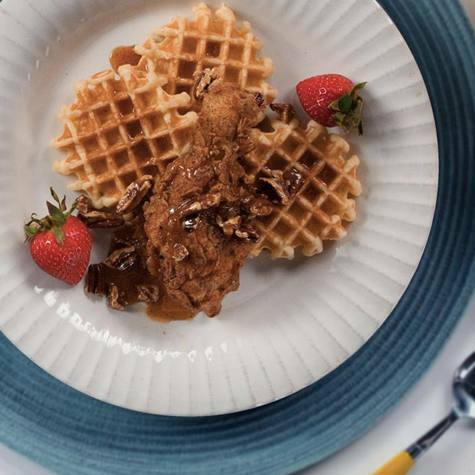 Place a fried chicken lollipop on each of the Belgium waffles and spoon over some of the maple and salted caramel syrup and serve.